I don't want to tempt Mother Nature, but this has to be complete rock bottom. I've never seen things worse than they are now. Watch February 15-25. Tropical forcing becomes quite favorable, and the stratosphere/NAM is perturbed. I have a hunch that this time it's going to work. could well be like 2005-2006 pretty terrible winter until mid febuary then we cash in on a wet past 12 incher aria wide. 80* and sunny. I mean....c'mon! 12z Euro is a paste bomb. Nukes Fred with a foot in 8hrs, we get about 4" of chowder. Most of it falls on Thursday morning, verbatim. Goes from 996mb to 972mb in 12hrs. 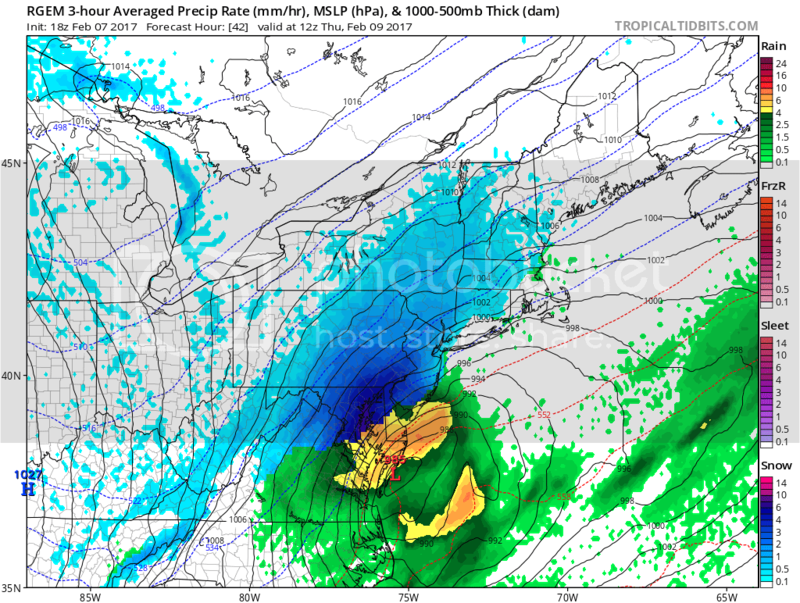 Fred gets absolutely destroyed..verbatim parts of New England would likely pick up a quick 2 feet of paste.. I haven't been on the up and up with models as work has been pretty busy. Lol no, this Thursday (the 9th). Boom. Please oh please let this verify. Lame. I fly back on Friday. Well there's another window of blizzard potential around the 20th, and it's not a given this this will work out. Complex evolution. Thing is, it's in the 70s today so we'll have to cool stuff off before we can accumulate. I might be too far south for the main show tonight, but a few vicious snow squalls look possible for tomorrow afternoon. Fred is gonna get smacked, though. Could be a quick 6"/2hrs type deal up there. It's really going to come down. Grab some video. High was 73 degrees today, so we'll see. A wall of dark clouds moving in from the west now, though, winds shifting from the W to the NE ahead of the low. Fred's area is now forecasted at 8-12". I'm probably stuck with "white rain" here until after sunrise, then maybe a few convective snow squalls tomorrow afternoon. Not in Philadelphia for what has a chance at being our only snow event for the winter. Oh dear, might have to ban your self for that language outside of the OT ! I feel for ya Fred. Right now I'd I'd sacrifice a newt on the altar of weather for freakin' rain ! Since records began, every solar minimum has produced at least one "epic" winter in our region. These tend to occur near/during the period with weakest solar winds. As we head into solar minimum over the next few years, we'll likely score a few big winters..either 2018/19 or 2019/20 should be legitimate. Next winter will depend on the ENSO state but could be nice if we go +ENSO and flip the QBO sooner. the more you look at this minimum cycle upcoming do you beleave it's behaving as a maunder or a dalton type of minimum. I'm not sure yet. Some of the predictive methodologies might also be erroneous in mistaking correlation with linear causation. I'm thinking Dalton type minimum now, but could be wrong. Blowing snow. About 35 degrees, winds up around 40mph. Wow, these flakes are feather-sized at times. Huge. Wind is also making that groaning noise in the rafters of the roof, so I know it's above 40mph when that happens. Still too warm for much accumulation so far. 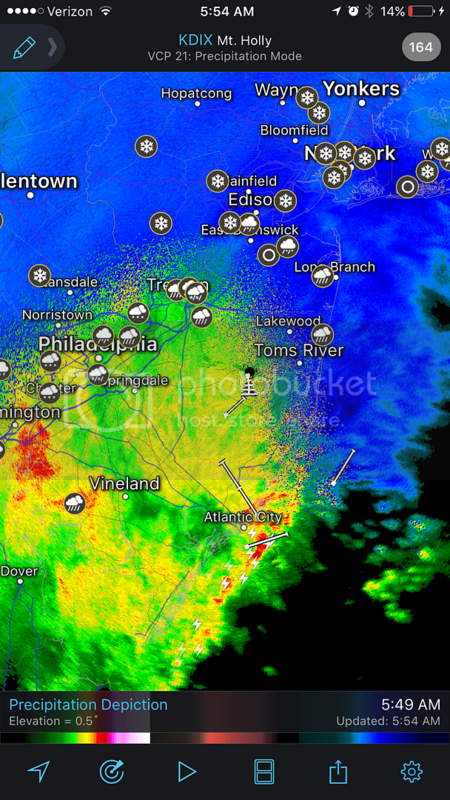 Thundersnow being reported in PA and NY with 1-3"/hr rates and a few gusts above 50mph in the NJ/Philly corridor as well. Lolz, thunderstorms w/ frequent lightning and waterspouts pound the Jersey Shore, while 1-3"/hr snow rates and gale force winds pound the Philly suburbs. Talk about a gradient and deformation zone. When this storm deepens and moves into New England..oh man they're gonna get smashed. To think it was 70+ degrees just 12hrs ago. Now it's winter again. Probably won't be the last whiplash event this year either. March loves to get all loopy like this in -ENSO years. Grand total of 0". Lol. Puked snow for 3hrs but the surface temperatures were just too warm to accumulate. Also seeing a few 50mph gusts across the region today as the pressure gradient tightens. Snowshoe is getting the good stuff right now. Blinding snowfall on the webcams, gusts between 50-60mph, with temperatures sitting around 10 degrees. 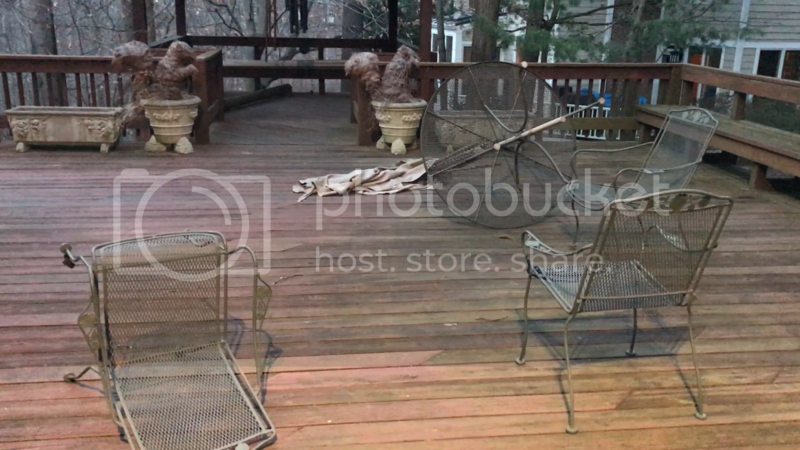 Huge gust just ripped through here. Caused the window glass to pulsate back and forth. Tough winds with the snow squalls today. Got one on video, easily 50+mph. Anything interesting on the horizon? yeah it certainly is complex and even more so to predict.one thing Robert Filex has been completely Hammaring on has been the underground volcanos in reason in part why our oceans have been warm and it's importants in the ice age cycle.he also in his book stated quite clearly that doing ice ages cycles the climate of Chicago tends to sifts south into Georgia plus add on the enso it an interesting on going puzzle to all put togeather. Yeah, watching the 20th +/- a few days. Following what could be another New England blizzard, follow-up wave could work if the confluence from departing storm is oriented properly. If not, borderline storm final week of February, and if that fails, one more shot early/mid March. this was always going to be a high risk failure in our reagion for one the such warm temperatures the last few days and also the fast movement of the storm this was always going to be more of new England storm then anyone else's and seem to have played out that way.I still those think we have more opportunities mid to late febuary even into march and I wouldn't be surprised if we scored on a event or two in our own doing the next few weeks as the pattern may be becoming more favorable for a few weeks. One of those squalls that roared through here today. As usual it dried out as it rode down the lee of the mountains and ended up being 90% wind, 10% snow. My reaction was due to our heavy table being picked up and tossed in my direction. Both Holton and Bannockburn topped 59mph during this squall, right around the corner from me. Edit: BES hit 68mph. That's less than a mile from me. Aftermath. Table kinda rolled around while on the ground, with the umbrella still attached acting like a sail of sorts. That's pretty breezy Phil. Always interesting to me that you get so much wind where you are. There's a lot of talk about the Midwest and southern plains getting high winds, and we do, but you seem to get it on a more regular basis. North Texas winds will pick up when spring arrives and we usually have nonstop blows of a week or so. Enough to drive one batty. Few people understand our wind climatology, even I didn't understand it fully until a few years ago, given our average wind speeds aren't very high and don't attract attention. 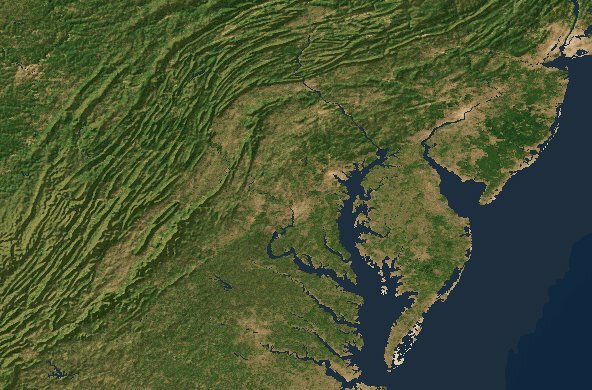 Outside the mountains, it's actually unique to the MD/VA domain west of the Fall Line, thanks to the axial orientation of the mountain ridges to our west relative to the climatological pressure gradient following cyclogenesis. What happens is adiabatic warming/drying on W/NW flow deepens the mixing layer, and frictional torquing/perturbation by the ridges idealizes mass transfer through our domain under a W-E pressure gradient, such that during pressure rises from the west under W/NW steamflow, vertical mixing is enhanced and adiabatically self sustaining, especially under strong insolation, where gusts at the surface can even exceed the 850mb wind speeds in some circumstances. While our *average* winter wind speeds are lower relative to the Midwestern states, we average about 28 days per winter with winds at/above 40mph, about 19 days per winter with winds between 45-55mph, and about 4 days per winter with winds at/above 58mph (high wind warning criteria), almost always out of the W/NW. It's actually not unusual for winds to approach or exceed 70mph at least once per winter. Last April, IAD gusted to 67mph during that gradient event, and gusts exceeded 70mph at other locations. You have to go back to 2011/12 to find a winter where winds failed to reach 70mph somewhere in the MD/VA lowlands west of the Fall Line, and that period still compensated with hurricane Irene in August 2011 (60-80mph along/east of Parrs ridge and the Fall Line) and the great Derecho of June 2012 (60-100mph across most of the region). Then winter of 2012/13 kicked off right away with hurricane Sandy (60-80mph) and followed with a huge wind event in March (60-70mph). So those stretches are mostly meaningless and often surrounded by impactful events for whatever reason. This winter, we have yet to experience a region wide high wind warning criteria event. The mid-February to mid-April timeframe is our windiest period climatologically, so usually that's when they happen. Note the manner in which the ridges "bend" into something resembling an 's' shape. This is the reason for the peculiarities of our downslope wind climatology. The strong west qbo and the strong pacific jet this winter is a interesting debated case I'm wondering if we had a weaker qbo number 5 or lower even if it was west if the results would have been different.perhaps just like the enso having the index to strong can be a bad thing as it tends to overwelem the patterns to much and in this case the qbo because it was at record strong west levels likey overwhelmed things to much and ruined good timed blocking we may have had other wise had if it was a weaker singal.like wise to strong of a east qbo I'm sure can be a bad thing as well which go's back to the point that you reather see them at low or moderate levels and not overwhelming at most times.those there is I'm sure exceptions. After the crap fest winter in 2001-2002 we had some great severe weather evens and wind events that spring pretty amazing to go from such a crap borning pattern to severe weather events and wind events glore. Well the QBO/NPAC-anticyclone correlation only applies in Niña system states, and this winter wasn't a coherent Niña state. So, when system state was in Niña mode, that NPAC ridge did dominate. When intraseasonal state override weak Niña background, the opposite occurred (as +QBO favors cyclonic state under +ENSO convective state). So quite the volitile pattern this winter. Didn't do much here this time, but plains and western US did swing quite a bit. Every warmer than average -ENSO winter on record has been followed by an active severe season, so yeah maybe that's something we should keep in mind. That February 20th window..man that has *serious* potential. Just a tiny tweak there will result in a complete phase with the backend shortwave, and subsequently we get a major east coast blizzard. Sometime within the next 24-36hrs we might start seeing some insane looking model runs. what is this febuary 15-16 storm deel as that the one many seems hype on at the moment. Phil, when you describe the winds as such, it is easier to understand as a lesson in physics. Doesn't get so caught up in met mumbo jumbo. Very interesting. Thanks for taking time to write that. Seems my sacrificial newt ceremony will pay off Tuesday. We're expecting .85" to 1" of rain ! 77* today and yes, windy. So close to a bomb, but need small tweaks to the orientation of the precursory waves. We've struggled with timing all winter, but if we can time this one properly, could be a 30-40" event for someone. you were talking about or is the 20th the next threat after the 15/16 one sorry if I got it confused. Could be either one depending on which waves interact and/or phase, and at what times. You know what I mean? Either one could be "the storm".